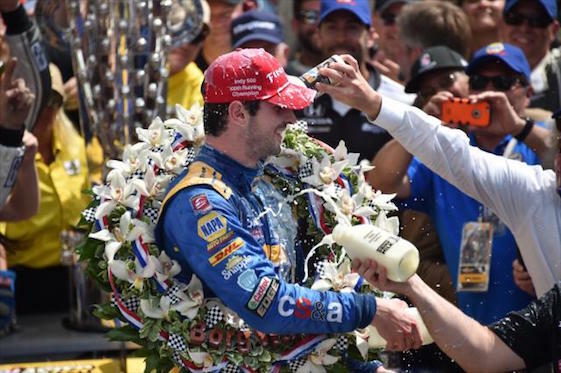 INDIANAPOLIS – American rookie Alexander Rossi listened to his boss and outdrove all the veterans Sunday on the way to a pulse-pounding victory in the 100th Indianapolis 500. Despite struggling at times on his pit stops and falling to the rear of the 33-car field early in the race, the 24-year-old Californian found a way to squeeze 36 laps out of his final tank of fuel, barely enough to become the first rookie to win The Greatest Spectacle in Racing since Helio Castroneves in 2001. Most of the leaders, including Rossi, pitted during caution period on lap 164 knowing they would likely not have enough fuel to get to the checkered flag. As driver after driver pitted for enough fuel to finish, Rossi, driving for Bryan Herta and Andretti Autosports, feathered his throttle and took the lead five laps from the end of the 200-lap race. He slowed visibly on the backstretch of the final trip around the famed 2 ½-mile Brickyard oval, but was all alone on the final straightaway, winning by nearly 5 seconds over teammate and runner-up Carlos Munoz of Colombia, who had pitted from the lead on lap 197. Rossi’s Honda-powered No. 98 began to sputter on the last lap and ran out of fuel in the fourth turn on the cool-down lap and had to be towed to the pits. The driver jumped out of the car and raised his hands in the air, saluting the huge crowd as they stood and cheered. 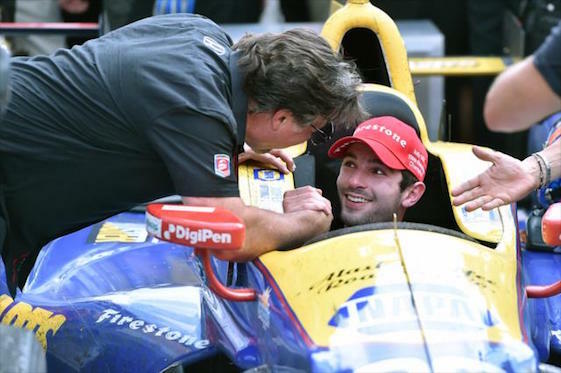 Alexander Rossi is congratulated by team co-owner Michael Andretti after Sunday’s win. was stoked again and then I was heartbroken again. “I think I’m going to need a psychiatrist after this race,’’ he added, laughing. Rossi’s goal since childhood has been to race in Europe and he steadily worked his way through the ranks until finally getting a shot at F1, running five races in 2015. 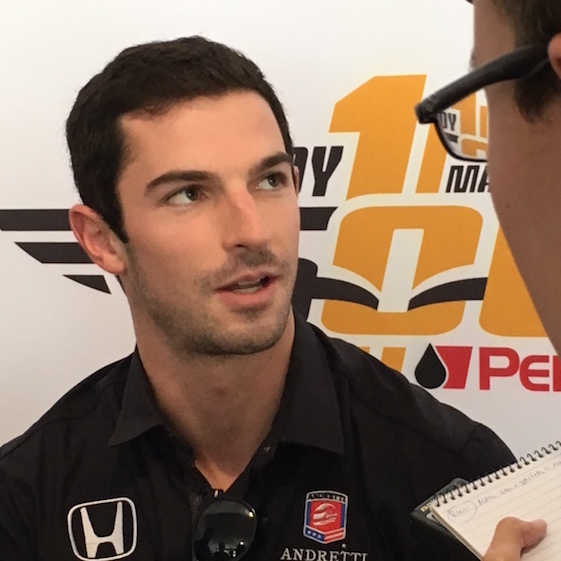 Though re-signed by the Manor team as a reserve driver for 2016, Rossi found himself without a real ride earlier this year until getting a call from Michael Andretti, whose Andretti Autosport team got its fourth Indy win Sunday. Andretti put Rossi together with Herta and kept both under the Andretti umbrella. “From the first race in St. Pete, I’ve felt at home in this series,’’ said Rossi, who took part in only his second oval race on Sunday. Andretti said he was happy to have Rossi on his team after following his career for years. Rossi watched Indy from Monaco last year. Rossi, running his sixth race in the Verizon Indycar Series, led a total of 14 laps Sunday, the first time he has been out front in this series. The buzz for the centennial race at Indy was huge, with more than 300,000 people showing up on a hot, humid day, giving the 500 its first sellout in more than 20 years. The race lived up to its hype, with nearly constant passing throughout the field and lots of attrition, thanks to crashes on the track and in the pits. 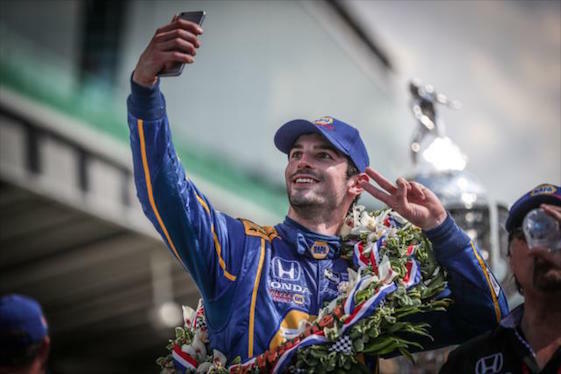 Alexander Rossi takes the ultimate selfie. Penske his 17th Indy victory on the 50th anniversary of his race team. But the Brazilian driver, who led four times for 24 laps, lost track position after being hit from behind by Hildebrand while running in the top five, forcing Castroneves to pit for a new rear wing. He wound up finishing 11th. After that, the race appeared to be between Kanaan, who won in 2013 and Newgarden, racing here for the fifth time with a previous best of ninth. Kanaan and Newgarden swapped the lead several times before the Brazilian driver began to fade and Munoz drove into contention, moving past Kanaan and into second on lap 186. But, at that point, everyone knew the leaders would have to pit for a splash of fuel to finish the race and Rossi was lurking in the top 10, watching as each of the top cars finally had to dive into the pits. Reigning Indy champion Montoya was one of several drivers to crash out of the race, bringing out the second of six caution flags on lap 64. “I went into (Turn 2) with a big push and, when I got on the gas, it just came around,’’ the two-time Indy winner said. 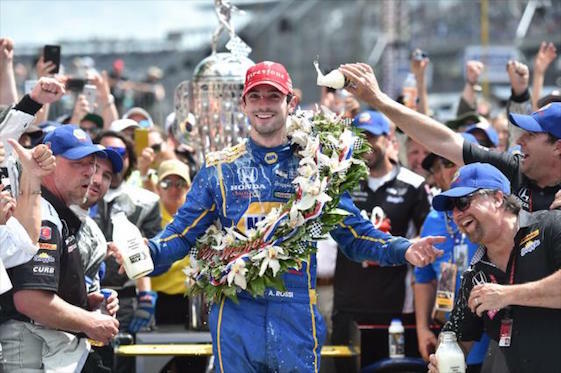 2016 Indianapolis 500 winner Alexander Rossi had a lot to drink on Sunday. Among the most disappointed drivers in the field were 2014 winner Ryan Hunter-Reay and Townsend Bell, two of Andretti’s five entries in the race Both led the race several times before being knocked out of contention with a collision in the pits during a caution on lap 117. Verizon IndyCar Series point standings: 1. Pagenaud 292, Dixon 235, Castroneves 224, Newgarden 211, Hinchcliffe 205, Rossi 203, Munoz 199, Kanaan 192, Kimball 189, Montoya 187.